It measures resistance of the EED bridge element. The operator can use a two-wire connection, or a more accurate four-wire connection. The operator can set the desired value of no-fire current. The tester applies the no-fire current level automatically, for the required time duration. The operator can set the desired value of all-fire current. The tester applies the all-fire current level, for the required time duration. 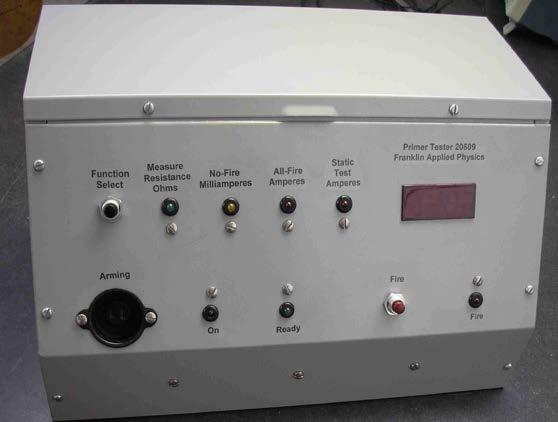 The tester provides a square-wave logic pulse output, to facilitate measurement of firing time. The case sits on a test bench. Rack mounting is an option. For operator safety, there is an arming plug. The weight is about 25 pounds.